Weather is turning cooler for most us and we look out for delicious, comfort food. 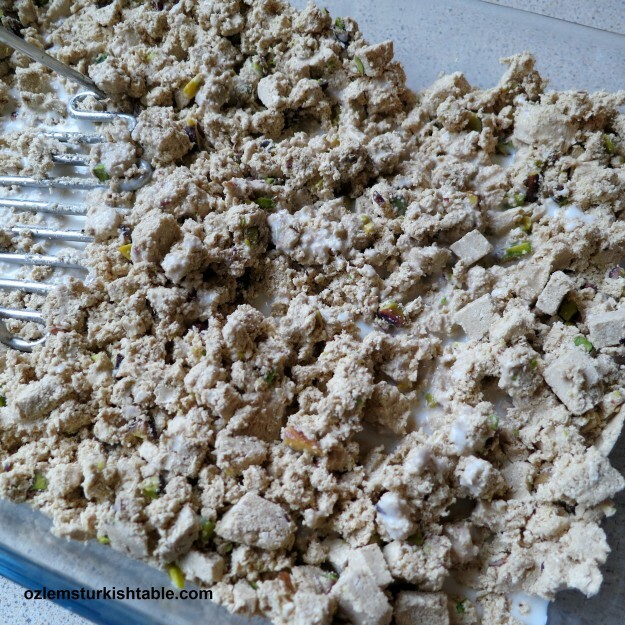 Tahini and honey based helva or halva, is a delicious treat enjoyed in Turkey; I especially love the baked tahini halva served in kebab houses and restaurants at home, such a heavenly taste. Helva, the Turkish name, derives from the Arabic ‘halva’ meaning ‘sweet confection’. 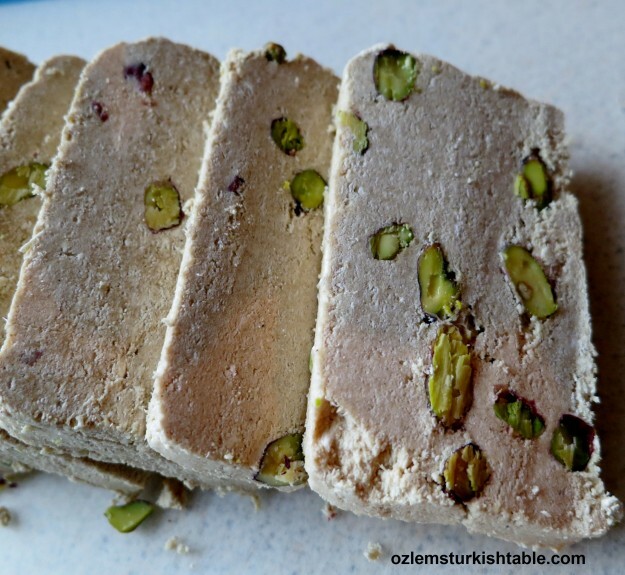 Halva is a very popular candy in Turkey, Armenia, Eastern Europe and the Middle East served in cafes and kebab houses. 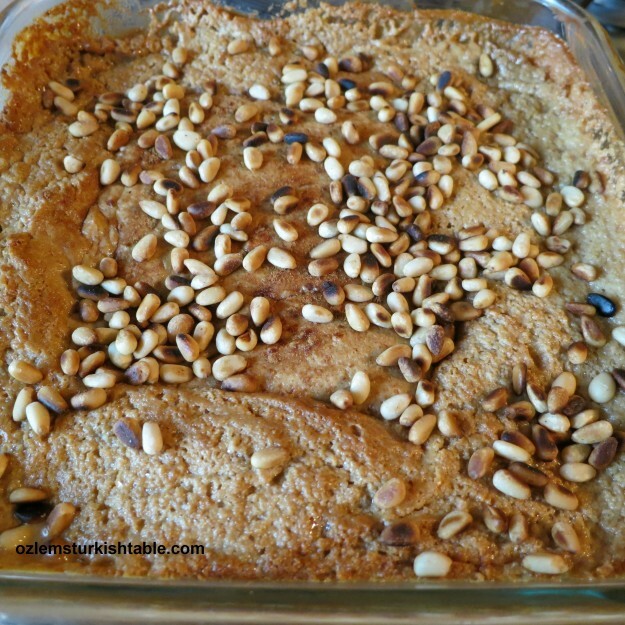 Halva is made primarily with honey and tahini and there are many variations of it. In the old days they would grind oily sesame seeds into a paste (tahini) and then mix it with hot honey. Nowadays prepared tahini is widely available in Middle Eastern stores abroad and at online stores like Best Turkish Food. Aside from the plain version of this sweet and flaky sesame based confection, there are many popular variations of Halva including chocolate and pistachio. The Turkish food store in North Cheam (address: 565-567 London Road, SM3 9AG, North Cheam) in the U.K. also carries Halva in packs. 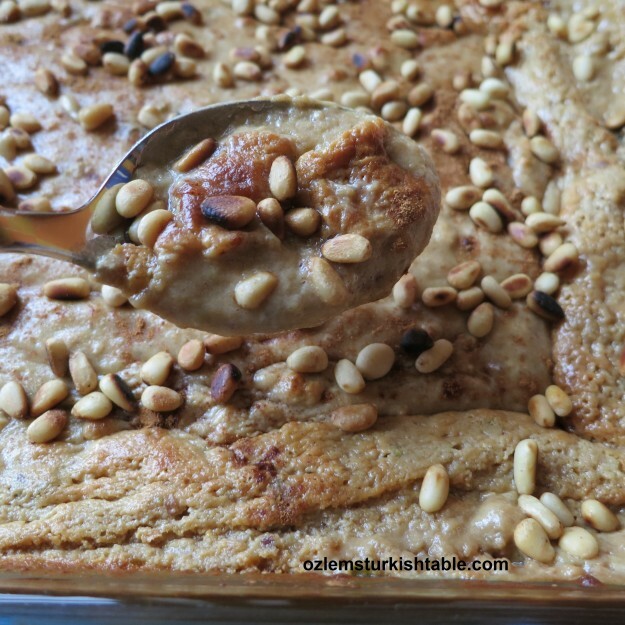 This nut-butter-based Halva is made from tahini/tahin (sesame paste) or other nut butters e.g. sunflower seed butter with primary ingredients of nut butter, glucose and sugar or honey. This halva has a dry, crumbly texture and keeps in the fridge well for a long time. You can slice the halva and have with crackers or toasted slice of bread; the taste is just wonderful. I was inspired by dear fellow blogger, Claudia for this delicious recipe and slightly adapted with the addition of pine nuts. 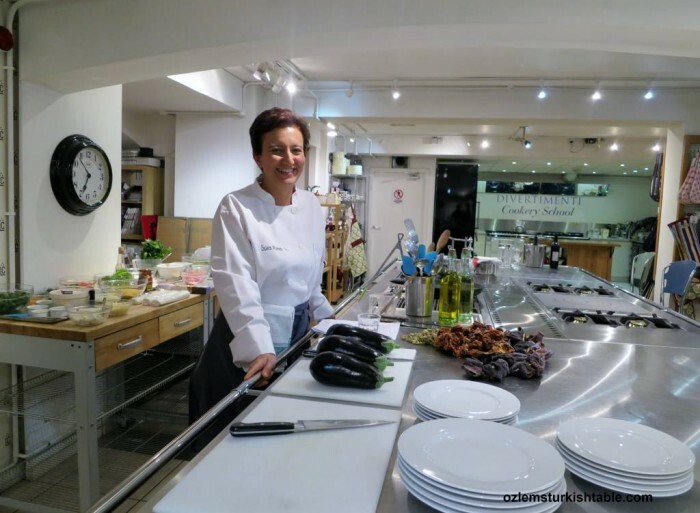 Please check her wonderful blog, A Seasonal Cook in Turkey, where Claudia uses the seasonal produce in Turkey for her delicious recipes. 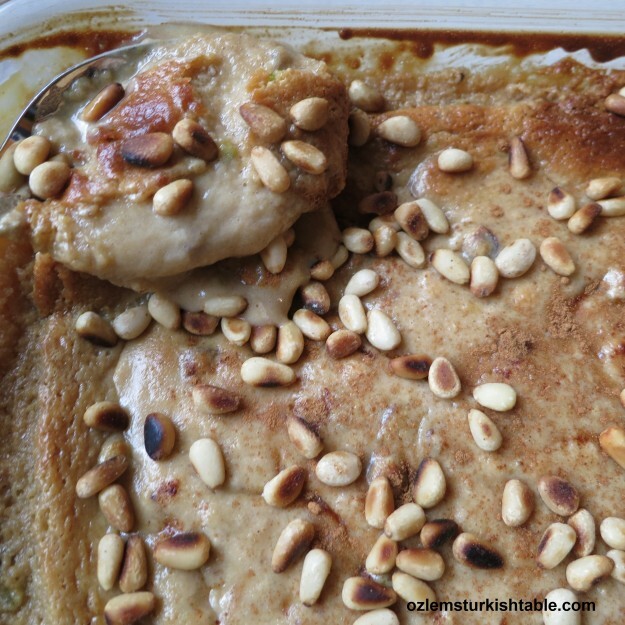 Here I chose to bake the tahini halva in the oven with sautéed pine nuts over the top. This dessert takes only minutes to make and it is so delicious; great for sharing with friends and family. 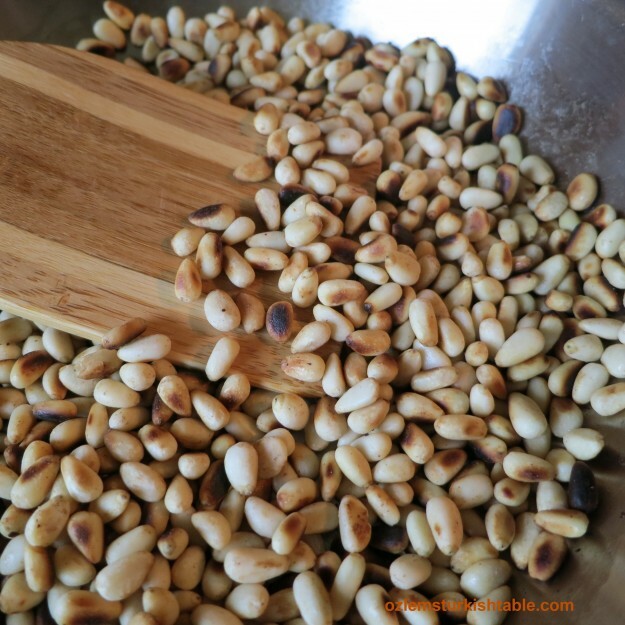 The sautéed pine nuts add a lovely additional flavor and texture; I hope you enjoy it. Mash the helva with a fork and then add the other ingredients, for a loose hummus consistency. Mash the helva with a fork and then add the other ingredients. If you like, use an electric hand mixer to reach a smooth consistency which should become like ‘a loose hummus’. Pour into a large baking dish or 6 individual or small ovenproof dishes. Sprinkle with cinnamon and place in the hot oven for about 5 – 10 minutes, depending on how deep you filled the ramekins. Sauteed pine nuts add a lovely texture and taste to the halva. In the meantime, sauté the pine nuts in a drizzle of light olive oil for a few minutes in a pan, until they are golden. Once the halva is baked, sprinkle the sautéed pine nuts over the halva and serve hot, with plain crackers by the side. Have you ever tried hummus warmed up? 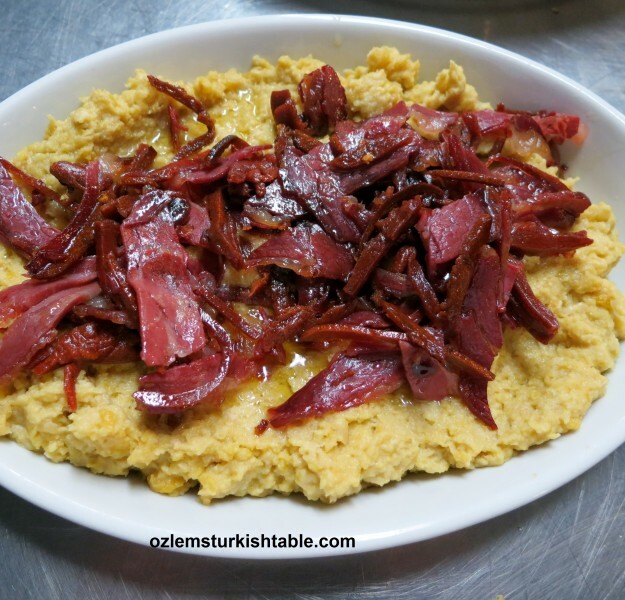 In Turkey, especially in the South, hummus is served warm with sautéed Turkish sucuk (sausage) – or pastirma (pastrami) or with sautéed pine nuts over the top. I strongly suggest you to try hummus this way, as I feel you may be pleasantly surprised and maybe converted to eat hummus warm as many of my friends have done. Warm hummus with sauteed Pastrami (Pastirma, Turkish dried cured beef) – the flavors complement each other so beautifully. Please adjust the recipe according to your taste, as some like it garlicky, some with more tahini and others may prefer it more lemony. 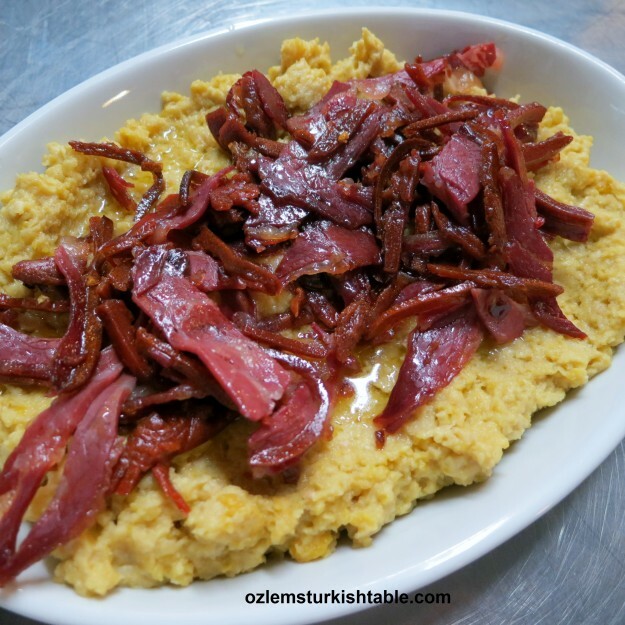 In my recent Turkish cooking class, I added the sautéed pastrami, pastirma, over warm hummus, as it is served in traditional kebab houses in Turkey. Pastirma is a dried cured beef coated with spices and has a delicious, rich flavor. The hummus and the spice coated pastrami has complemented each other so beautifully here. If you can’t get Turkish pastrami, you can use the Italian pastrami or your favorite cured meat or grilled meat. 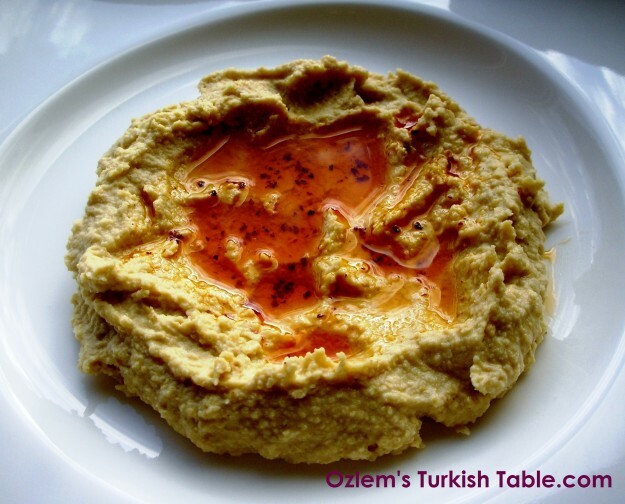 Warm hummus with red pepper flakes infused olive oil – a delicious vegetarian dip. This warm hummus would make a wonderful appetizer to share with friends and family and goes so well with grilled vegetables or meat by the side. For a vegetarian option, you can serve the warm hummus with red pepper flakes infused olive oil, this one is so delicious too. Both these options may also be wonderful addition for the Mother’s Day spread, if you are celebrating. 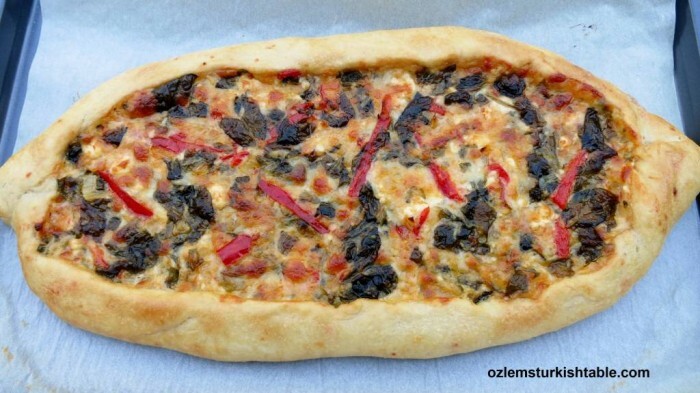 Pita bread is the perfect accompaniment – hope you enjoy it. If using dried chickpeas (garbanzo beans), drain the chickpeas and transfer them to a pan with plenty of cold water. Bring to boil and boil for a few minutes. Then lower the heat and partially cover the pan, Simmer the chickpeas for 1 hour, until they are soft and easy to mash. If precooked chickpeas are used, drain the juice and give them a little wash in a colander. Put the precooked (or cooked) chickpeas in a food processor and blitz them together with the extra virgin olive oil, water, lemon juice, garlic and tahini. If it appears thick and difficult to blend, add a little more olive oil or water. 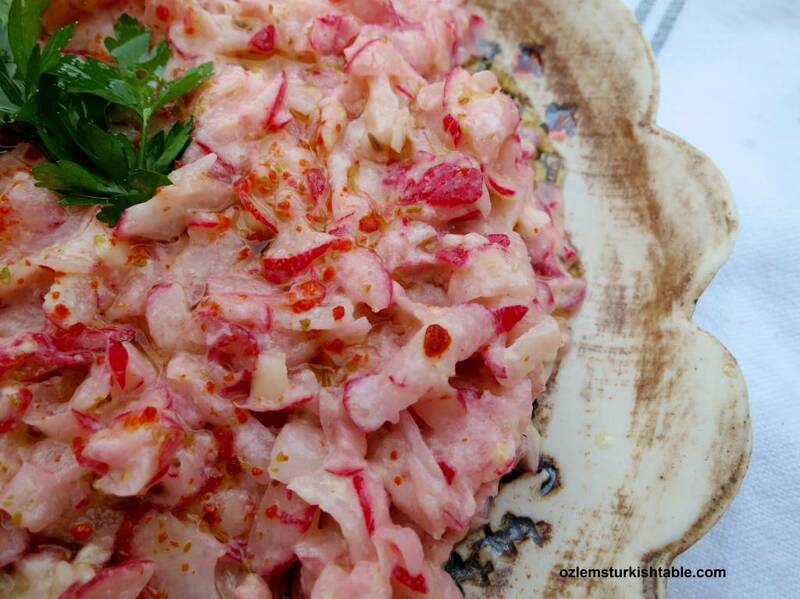 Season with salt and mix in the cumin and red pepper flakes (if desired). Process until you achieve a soft, smooth paste. Refrigerate until required. 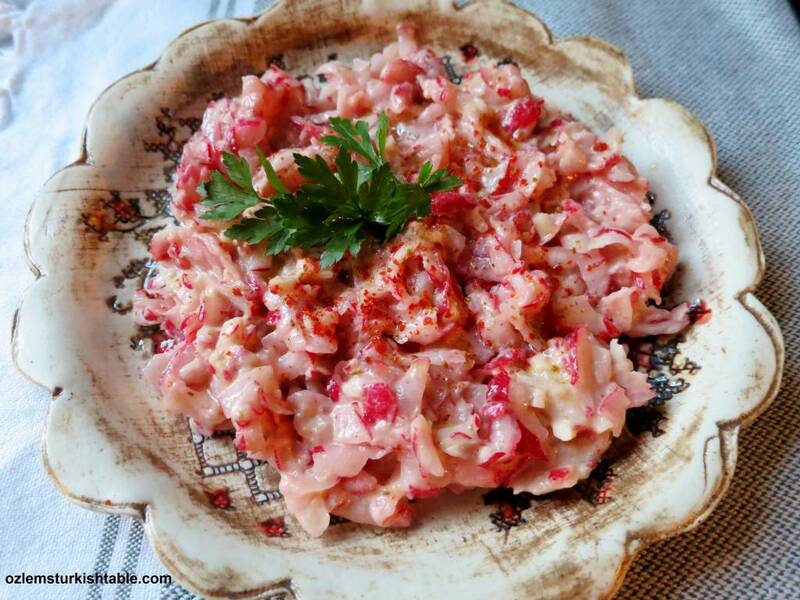 Warm hummus with sauteed pastrami; makes a delicious appetizer and goes well with grilled vegetables and meat. Just before serving, add a splash of olive oil and heat the hummus in a pan for a couple of minutes. In a separate pan, sauté the strips of pastrami in olive oil. Place the warm hummus in a plate with the sautéed meat over the top, scattering some ground cumin and red pepper flakes over. Serve immediately with slices of pita or flat bread by the side. 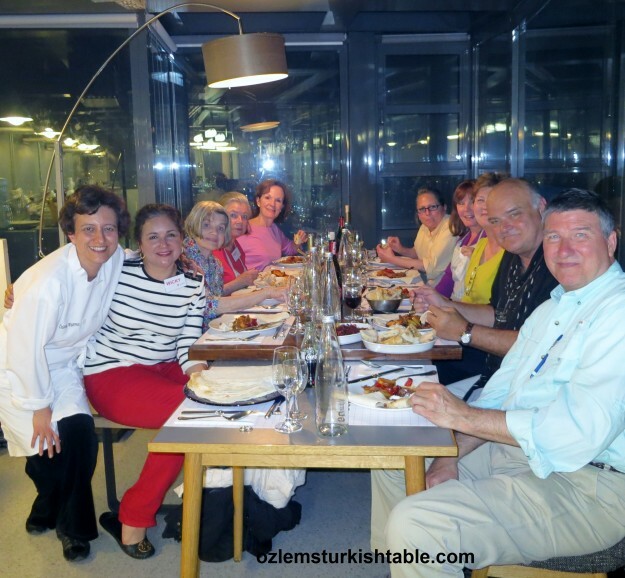 We all enjoyed the warm hummus as part of our Turkish cookery class at the Istanbul Culinary Institute. 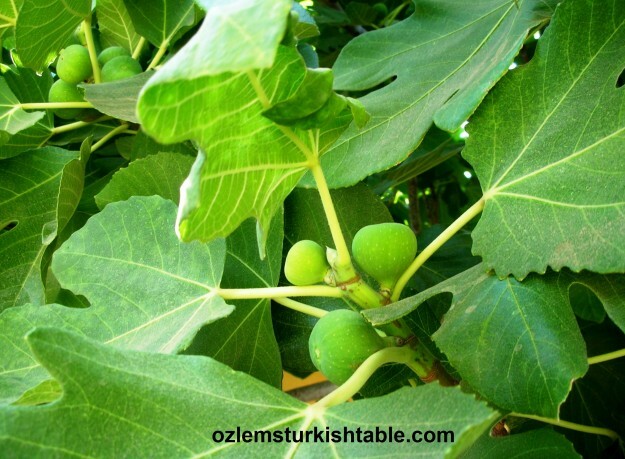 Driving towards Canakkale, we saw bountiful fig trees, just beautiful. 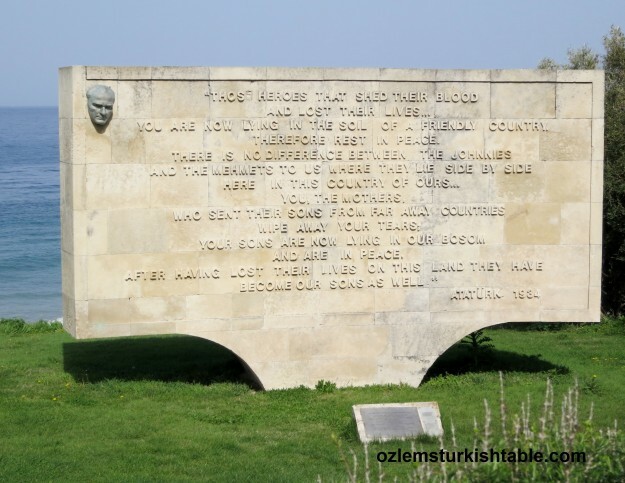 Our culinary and cultural tour to Turkey has almost come to an end; going to Gallipoli and visiting the battlefields near the Dardanelles has been a highlight to many folks and did provide a reflective, emotional moment. 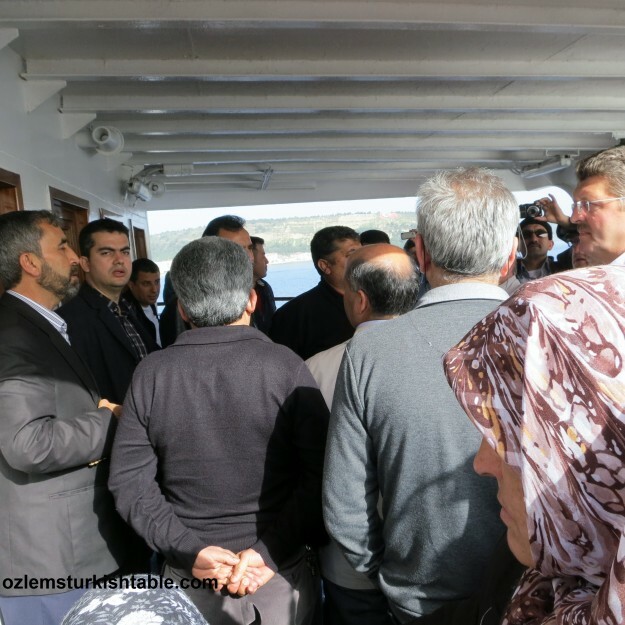 Ferry trip from Canakkale to Gallipoli, Gelibolu. 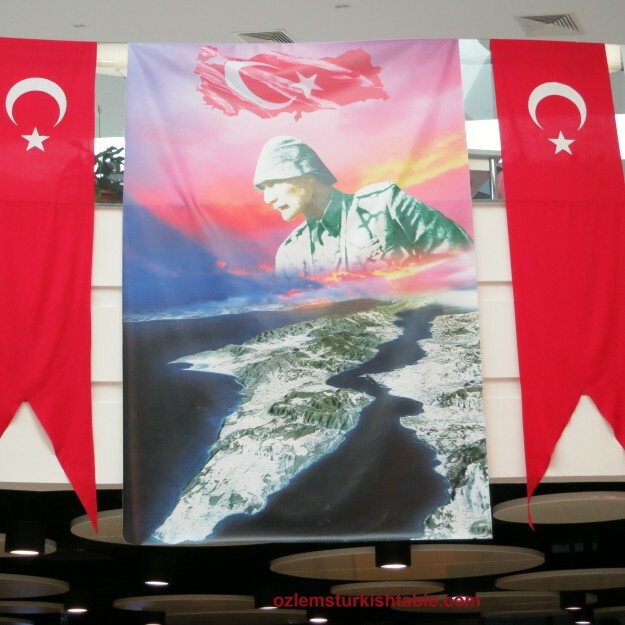 Gallipoli, Gelibolu is a peninsula in North-west Turkey, close to Istanbul. The Gallipoli Peninsula is the site of extensive First World War battlefields and memorials on the north bank of the Dardanelles Strait. 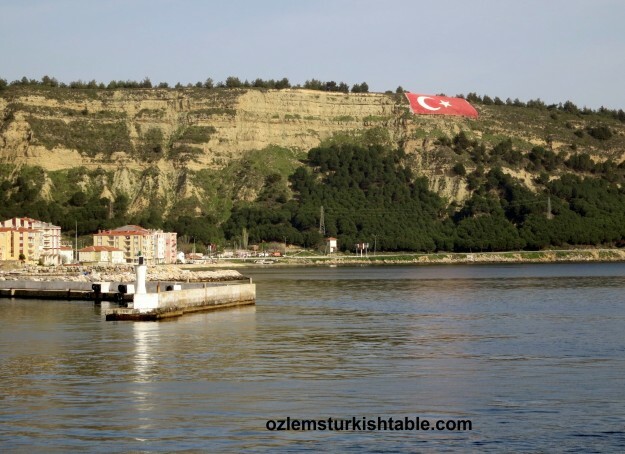 You can take the ferry from Canakkale to go to Gallipoli like we did, it is easy and convenient. A surprising and emotional moment, hearing the locals singing Gallipoli folk songs at the ferry. While on the ferry, all of a sudden we saw a group of locals gathered at the deck, singing Canakkale Turkusu, Gallipoli Folk Song whole heartedly. I remembered singing this folk song as a child, it was a surreal and an emotional moment, we all joined in. The impressive Gallipoli Kabatepe Museum (or Gallipoli War Museum) was recently opened and so well worth a visit. It has 11 gallery rooms, each equipped with advanced high-tech simulation equipment and the technology allows visitors to choose their presentation language and interact with the display. The centre houses an extensive collection of historic items relating to the renowned World War I campaign and we have been told that the simulations are so real. 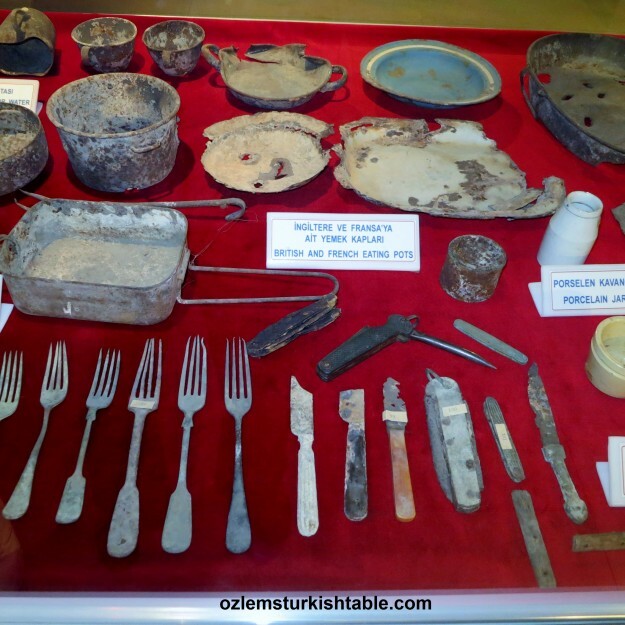 Gallipoli Kabatepe Museum hosts numerous relics from the campaign including weapons, uniforms, ammunition, letters written by soldiers to their families, photographs, and private belongings such as shaving tools, cocoa tins and cutlery. A very poignant and emotional moment to view and get so near to each piece. We then drove up to the Ariburnu Cemetery, at the beautiful Ariburnu Beach. 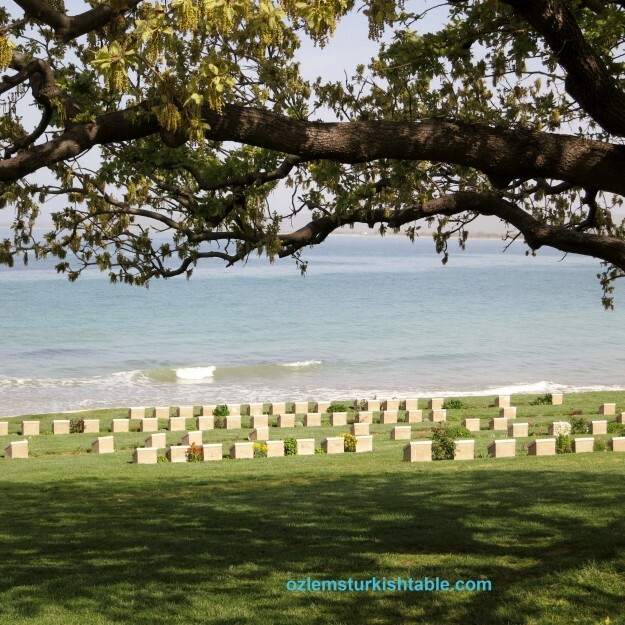 The Ariburnu Cemetery is situated on the north edge of ANZAC Cove by the shore where the Anzacs first landed on 25 April 1915. We were told that 253 Allied soldiers rest in the cemetery; it was very emotional visiting the graves. It is such a peaceful spot and may all those souls rest in peace. 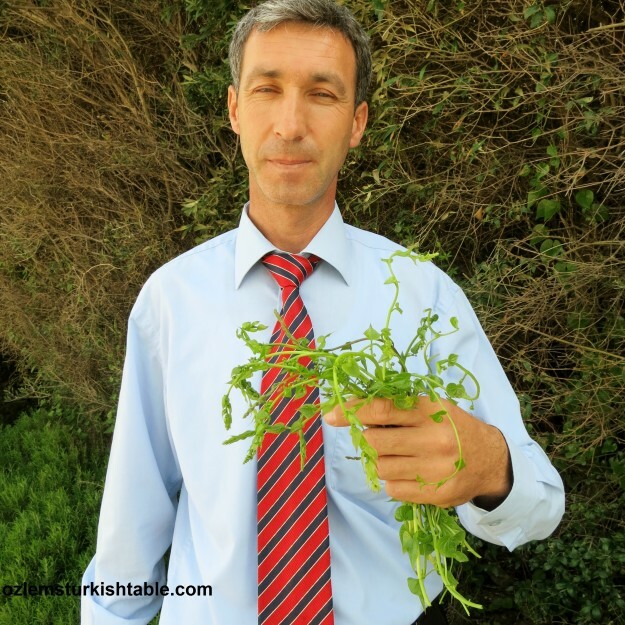 Just as we have been reflecting on what we’ve seen on Ariburnu Cemetery, our dear driver, Mehmet Bey excited came forward to show the wild greens he just picked up by the side road’ “Ozlem Hanim” he said “ these are the best Sarmasik (Wild Ivy) you can get. 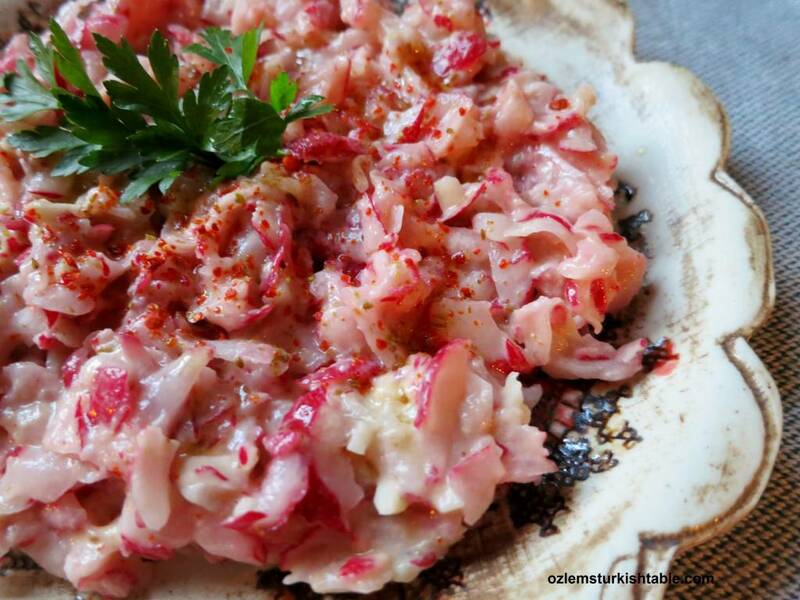 I will sauté with garlic and crack my eggs into it tonight, delicious!” Being from the Aegean region, I know how much Mehmet Bey loves the fresh, wild greens – food managed to bring similes to face again. And off we set towards Istanbul, looking forward to the buzz of the city and that baklava class..